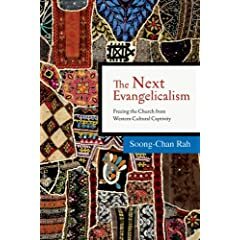 The Next Evangelicalism: Freeing the Church from Western Cultural Captivity by Soong-Chan Rah, opens the door to hard conversations that we, as followers of Jesus, must no longer avoid. Talking about race, reconciliation and idolatrous captivity of the church is uncomfortable but, if we are serious about redemption (both within and through the church) we must engage these sensitive issues. There are portions of the book that are intended to provoke. There may be times when the reader may react with anger, derision, defensiveness and so forth. But as you read through the major arguments of this book, I hope you will find my deepest concern for the church, the body of Christ… The true intention of the book is to bring reconciliation and renewal to the church in America. Perhaps it is because I can relate to so much of Soong-Chan’s personal experience he describes in this book, but I did not feel that his tone was hostile or unnecessarily confrontational. In many ways, this introductory statement embodies one of the key points of the book for me: the willingness to listen and gauge people and conversations that is vital for the church to learn in our increasingly multicultural world. In the worship life of the congregation, the Western priority of the individual determines the approach to worship over the biblical guidelines for worship. Worship in the white captivity of the church is oftentimes a collection of individuals who happen to be in the same room. Worship is just between the individual and God, and the church service exists to help facilitate that individual communion. Even more, this captivity to individualism reduces sin to a strictly personal issue, which renders us “unwilling to deal with social structural evils, and this reduction prevents us from understanding the full expression of human sinfulness and fallenness.” As someone raised in this tradition, I understand this all too well. There is a sad irony to all of the ranting about “total depravity” in which my faith was steeped — as sick as certain individuals might be, and despite the scope of sin’s influence in our individual lives, it was not until I began to understand the impact of sin to create brokenness out in the world — in society, culture, politics — that I grasped the enormous damage sin has wrought. While I continue to acknowledge our personal responsibility in dealing with sin, reducing God to becoming “angry” over only our personal wrongdoing makes Him seem petty and/or irrelevant to the reality of the world in which we actually live. Soong-Chan’s brief recap of the “Rickshaw Rally” debacle and Lifeway’s absolutely shameful response still makes my heart grieve. Worse, Lifeway inauthentic “apology” (we’re sorry if we offended anyone), their refusal to enter into genuine dialogue and their final conclusion to wield their power in a thoroughly un-Christian manner (“the decisions we make in this are ours to make and not yours”) are not out of the ordinary in the life of the church today. Unfortunately, many of us have felt the sting of racism within the church, whether it was born of purpose or ignorance. Thankfully though, as The Next Evangelicalism describes, groups like Youth Specialties have forged a different path towards understanding and reconciliation in how they handled a smaller, but similar, situation. Instead of brushing off the concerns of fellow members of the body of Christ, YS listened, took an honest look at themselves and took swift, public action toward reconciliation. Next‘s discussion of “triple-consciousness” reminded me of Dave Gibbon’s work with third culture. Instead of viewing our background and experience as a curse — i.e., alienation and displacement because we cannot go “home” to a place that was never home in the first place, nor can we be fully accepted in American culture — Jesus can redeem and transform these experiences in ways that will embody and bring the Kingdom in tangible ways. Instead of leading to bitterness or frustration, our experiences can lead us to be more understanding of others, to empathize with their pain, and to be quick to listen rather than to speak. That would be a revolution, in and of itself, and would powerfully display just how different the kingdom of God actually is. The question often asked by those who are from the dominant culture is, “How can I live out third culture/triple-consciousness as part of the majority?” While there is no simple, easy solution (which would, again, play right into the cultural captivity of materialism and consumerism), I believe it begins with listening – humble, empathetic, patient listening. Isn’t that what the Bible prescribes for followers of Jesus anyways? While it might not be easy reading for all, I definitely recommend this book. For both those conversant in issues of race and culture, and for those just beginning, The Next Evangelicalism provides important insights and also raises important questions. If we can live in and work through those questions with honesty and faithfulness (both to God and to one another), then perhaps we will see the kingdom break into our world in all its diverse beauty. Fascinating. Must get hold of the book. Johnny – Thanks for the comment. I’d love to hear your thoughts after you read the book, especially with your perspective from the UK! It sounds interesting but what is the purpose of the book? I mean what point is the reader trying to convey.